It is the most important section because all the case option is displayed here. From here you can create a case, view case by status, etc. Create Case – Creates a new case. Show All – All the created cases will be displayed. 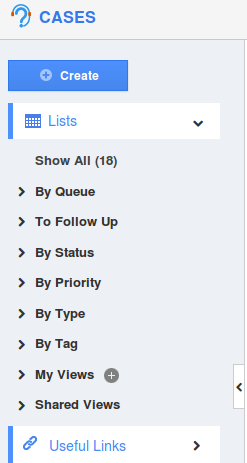 By Queue – cases assigned to employees and team will be displayed. To Follow up – follow ups scheduled for employees and team. By Status – Cases based on status. By Type – Cases based on type. By Priority – Cases based on priority. My Views – Views saved by you. Shared Views – Views shared by others. Quick Links – Directs to specific App start guide.